The day after Christmas 2004 many of us watched in horror as pictures of the Tsunami in South East Asia filled the press. For Softchoice it was the beginning of a different kind of wave that changed our Brand. Softchoice today is known for its corporate giving but it wasn’t always this way. As a company we had not been involved in any kind of organized corporate giving. But, the employees of Softchoice decided that they could do more. They decided to raise money so that we could be involved in providing help. Grass roots fundraising started, garage sales were organized, bake sales were held, hats were passed at customer golf tournaments. I can’t tell you how many other events were run – some of them raising only hundreds of dollars – however the sum total of these activities raised $85,000 to be put to use in helping those that had lost so much. As the team looked for ways to spend the money we came across a lady, Janet McKelvey, who had been similiarly moved by the events of Christmas 2004. She had a plan (TRIP Canada) to help 24 Sri Lankan families who had lost their homes in the Tsunami. At first the team agreed to provide the funds to build 3 houses at a cost of $18,000! Then Janet asked us if we wanted to send any of our people to help with the building. As the head of Human Resources I was responsible for planning training for a group of high potential employees and while unconventional this seemed like a real experience to involve people in. 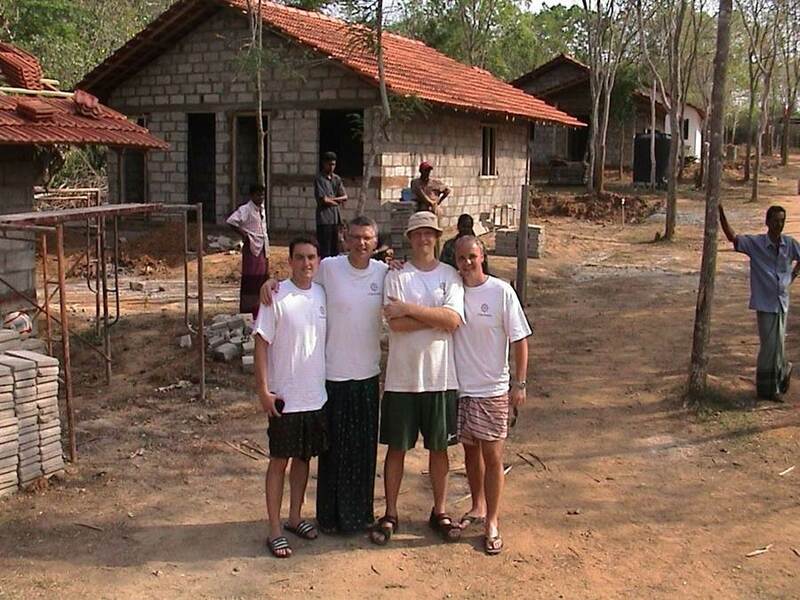 In 2006 four of us experienced two weeks of blistering heat and a muriad of blisters as we dug the foundations for some of the planned homes in the village of Tangalle, Sri Lanka. When we returned, we held a company-wide conference call with all employees – you could have heard a pin drop as Edwin Jansen, Scott Harper and Paul Asseff described the experience. We knew that we couldn’t stop there. The experience in Sri Lanka changed me. A local Sri Lankan had thanked me for helping build houses and I said in a self-depracating way, “It was nothing”. He took me to task and said, “It is EVERYTHING! This is a home where a family will be safe, where they can eat sheltered from the sun or the rain, where the children can study under the lights into the evening, where they can build community – it is EVERYTHING!” As I reflected it came to my awareness that the “nothing” comment was really my own sense of having SO much and in relative terms doing so little. From that moment I knew that I could do more. Today, all philanthropic activities of Softchoice are organized and managed by an employee-run board called Softchoice Cares. Many of the principles of this board were shaped by ideas gathered from our own experiences and through the learnings of Peggie Pelosi from Orenda Connections. Peggie authored a book called Corporate Karma and she helped us to realize that our Corporate Social Responsibility program would have greater success if there was some relationship to our industry or the skills we have. As a result we moved to help bridge the Digital Divide – helping people in North America and around the world gain access to technology. In April of this past year, Softchoice sent 14 employees to Bali where we helped an orphanage organization the Widhya Asih Foundation with 400 children in its care. The Softchoice Cares Board and our employees canvassed our business partners and were able to assemble more than $100,000 in donations from Cisco, Microsoft, Sophos, VMWare and others so that we could upgrade the technology infrastructure providing internet access at each of the seven locations in Bali. It has become part of our culture to give back. On any given week there are usually one or more Softchoice Cares events running. It could be a ball hockey tournament, or dodge ball, or it could be a movie night in Seattle, or a customer golf tournament in Dallas. These things make up the rich tapestry of events that are part of the brand of Softchoice. We help people less fortunate. We volunteer our time. Why? Because it is EVERYTHING! The experience we have in giving adjusts our values. Our evolving values change our behaviours and therefore our culture. And over time our Brand takes on the character of our culture. Gauranteed. Want to change your brand? The only authentic, long-term way is to delve into Values and Beliefs. Talk about them, consciously decide what you want to be known for and then engineer the management behaviours that align and will drive the culture you expect. Brand will follow and then brand marketing is not aspirational – it will represent reality!